One of the most respected and revered figures in sport, George Raveling is basketball — and so much more than basketball. The current Director of International Basketball for Nike, he was the first African American basketball coach at Villanova, University of Maryland, Washington State and University of Iowa before closing out a storied career at USC. He is an inductee into several halls of fame, including the College Basketball Hall of Fame and the Naismith Memorial Basketball Hall of Fame. He is a civil rights activist, outspoken on a wide array of social issues at the intersection of race, education and athletics. A world-class educator, he is a moulder of boys into men, and men into better men. Bottom line? George Raveling is the mentor you wish you had. But you can just call him Coach. This week I sit down with a truly remarkable man. A 79-year old with the vibrancy and energy of a college student, I was immediately struck by George’s insatiable thirst for learning. His passion for ideas. And his devotion to people, human potential & personal development. Coach has lived life. And he’s got stories to prove it. Inspirational stories about breaking racial barriers during the era of segregation. Instructive accounts of owning your destiny. And of course there’s the legendary saga of how a young George came to stand alongside Dr. Martin Luther King, Jr. on the steps of the Lincoln Memorial during the March on Washington as Dr. King delivered his historic I Have A Dream speech. 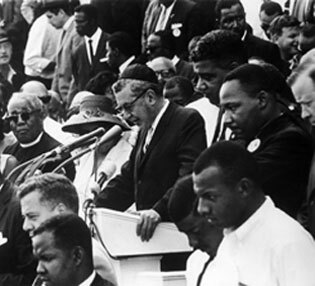 August 28, 1963 — George Raveling (lower right, foreground) just after Martin Luther King, Jr. (middle right) delivered his famous “I Have A Dream” speech during the March on Washington. There’s so much more to this incredible story — and to George — but I’m not going to spoil it here. I’ll let Coach tell it in his own words. This is a phenomenal conversation about breaking barriers. It’s about self-governance, self-belief and self-responsibility. It’s about literacy, civil rights and humanity. And it’s about the importance of being a positive difference maker in the world. An absolute gem of a human being, George is a national treasure. I loved every second of my time with him and something tells me you will too. So take a knee and huddle up, because Coach has a message for you. P.S. – As I only had 75 minutes with George, we barely scratched the surface on his life and wisdom. So please consider this episode a mere first installment in what I can foresee as a series of powerful exchanges. If you enjoyed this conversation, let me know what else you would like to hear from Coach by leaving your thoughts on reddit and perhaps I can cajole him to return for some pinpointed discussions on specific topics related to human potential, performance and personal development. Harrys.com: A superior shave at an affordable price. Type in my coupon code “ROLL” at purchase for $5 off your starter set and get an entire month’s worth of shaving for just $10 when you visit Harrys.com/ROLL. MeUndies: The worlds most comfortable underwear! Whether you want a subscription or a single pair, head to MeUndies.com/ROLL to get free shipping (in the U.S. & Canada) and 20% off your first order.